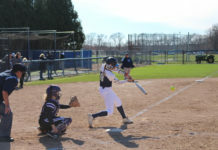 The University of Rhode Island softball team (9-12) visited George Mason University this past weekend to begin Atlantic 10 Conference play, splitting a Saturday doubleheader with a 2-0 win, followed by a 4-0 loss and a 4-1 loss on Sunday. 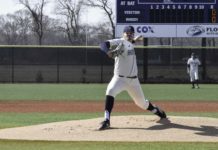 The opening weekend for conference play could not have started out much smoother for Rhode Island, as they began the series with a 2-0 victory. Their ninth win of the season was due in major part to the pitching of freshman Becca Rogers (7-4), who had a no-hit bid broken up with two outs in the seventh inning, after a single by Brooke Sullivan found its way through the infield for the lone Patriot base hit. This performance was the first career complete-game shutout for newcomer Rogers. She added a career-high seven strikeouts on the day and allowed only two walks. At the top of the third inning Rhode Island got out to an early 1-0 lead. Marylynn Muldowney started the inning off by reaching base on an error before advancing to scoring position on a groundout. Muldowney was later batted in from a two-out single off the bat of sophomore Kylie Shivery for her 20th RBI of the season. Shivery also accounted for three singles in the win, the second three-hit game of her career. In the top of the fourth inning the Rams increased their lead to 2-0. Senior Lauren Klepchick got on base off of a one-out double. She was pinch ran for by fellow senior Olivia Hendricks, who was sent home by a one-out single by senior Taylor Archer for her sixth RBI of the season. George Mason rebounded in the second game, jumping all over senior pitcher Caitlin Kennedy in the first inning. 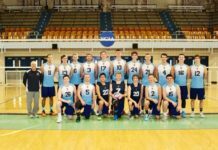 Kennedy settled down thereafter, but the damage had already been done, with Rhode Island unable to generate any offense and falling 4-0. The struggles carried over into the next day in the rubber match. Once again the Patriot offense ignited in the opening frame, taking a 3-0 lead that they would maintain for the game’s entirety. Rogers lacked the command she had in the first game, but like Kennedy the day before she was able to regroup and go six innings while allowing just four runs. The Rams went without an extra base hit and only had two during the series. Their lone run came when pinch runner Hendricks crossed home plate on an error. Despite the series loss, the conference is bunched up with the Patriots at 13-10 having the best overall record, giving hope to a team that has already eclipsed a dismal last season.